Library hwgdebug.lib, which should be linked to the application, that you are going to debug, before the standard hbdebug.lib. Its sources are in hwgui/source/debug, it is part of the HwGUI project, but does not contain calls of HwGUI functions and classes and therefore can be used with console applications, and GUI applications built using any other GUI library. the executable module hwgdebug.exe - actually, the debugger - standalone ( in contrast to the standard, built-in debugged application ) GUI program written in Harbour+HwGUI. Its sources are in hwgui/utils/debugger. HwGUI is a cross-platform library, so, an executable can be built under Windows and under other operating systems where GTK presents ( Linux, for example ). 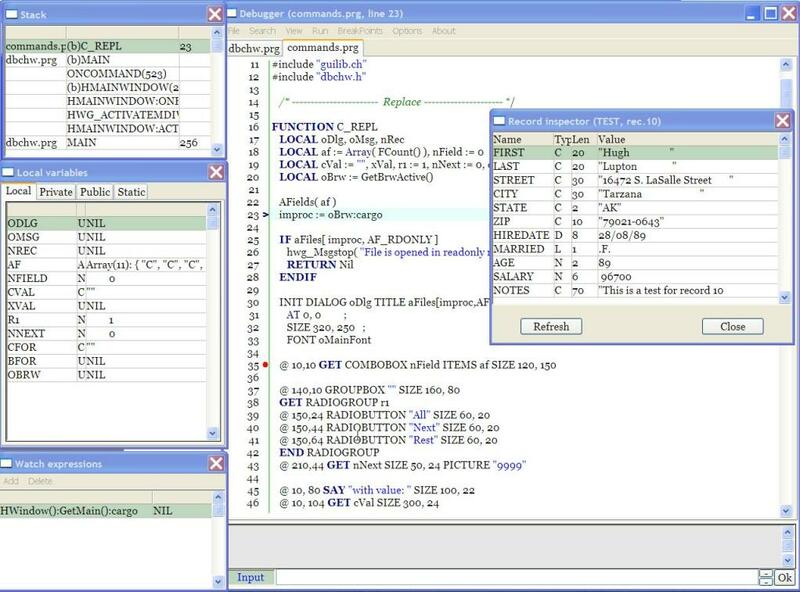 The debugger connects to the debuggee through special files that can be arranged in any convenient place. Therefore, the debugged program may physically reside on a different computer and even be built on another OS. Thus, we can, using the Windows version hwgdebug.exe at its computer, to debug a program running on some other computer in the network under Linux or, for example, OS2. This approach allows, in particular, to implement debugging applications in IDE, I donate this idea to IDE developers :). Sources of the debugger, as already mentioned, are in the HwGUI sources distribution, binaries ( library and debugger), you will find in the HwGUI binary distributions - look at the appropriate page. In addition, you can download the debugger binaries in the form of a separate package hwgdebug-2.04.zip, it includes libraries for Borland C and Mingw and executable - as you know, has no meaning, what is the compiler it is built with, and even what language was used. An application is built in the same way as before, as with a standard debugger. We add the -b option to the command line of the Harbour compiler and add the debugger library to the list of libraries for the linker, only now it's not hbdebug.lib, but hwgdebug.lib. As before, simply run the application. At startup, it tries to find and start the debugger. For this to happen, it must be located or in working directory of the application, or somewhere in an accessible place ( pointed with the PATH environment variable ). You can specify the location of the debugger in a special file hwgdebug.info but about it later. If the debugger is not found, the program displays a message "Hwgdebug isn't available..." and the work continue without the debugger. Run debugger itself and then run the debugged application from it, using the menu File/Debug program.. In this case, as in the previous case, the application runs on debug immediately. and then run separately the debuged program, where should be a file hwgdebug.info indicating the same directory. Exactly this mode allows you to debug a program remotely. Dir is the name of the directory for storing temporary files, which connects program to a debugger, this directory must have read/write access for program and debugger, it can be placed in any convenient place in the network. Specify this setting is necessary when you start the debugger with the variant 4 ( see above ). Debugger - path to the debugger and his name can be specified if it location is not specified in the PATH, or if you want to use another instance of the debugger. RunAtStart - if this option is omitted or set to Off, debugging starts with the first executable line of the program. If it is set to On, it starts as a standard debugger - in-place program, where pre-set Altd(2); Altd(). If the debugger and your program will run normally, they are connected, and the program stopped ( on the first row or after the Altd() ), in the header of the debugger window appears the name of the corresponding prg module and line number where was stopped, in the main window of the debugger should appear the text of the prg. If the header prg name and line number are in a header, but the text window is empty, this means that the prg isn't found ( it is located in a different directory ) and you need to specify the path to it using the menu File/Set path. Go, Step, Trace, To cursor, Next Routine, Animate, adding and removing of breakpoints ( to do this, you can double-click on the relevant line ), viewing Workareas - for them, there are the same shortcuts. View variables ( local, private, public and static ), the adding of the so-called Watch - expressions, which values are calculated at each iteration, view the call stack procedures ( double-clicking on any of them, we switch window with the text of the program on this procedure ). Record Inspector - view of the current record of the opened database, to show it press Inspect button in the Workareas dialog window, or input the command :record ( see below ). Object inspector - view of the variables and methods of a chosen object, to open it doubleclick ( or press Enter ) on appropriate line in a Variables dialog window, or input the command :inspect ( see below ). Array inspector - view of the variables and methods of a chosen array, to open it doubleclick ( or press Enter ) on appropriate line in a Variables dialog window, or input the command :inspect ( see below ). Evaluation of expressions during debug - enter the expression in the input window at the bottom of the main window of the debugger and click OK or press ENTER - the result should appear in the window a little bit higher. By using the buttons to the left of the OK or press Up, Down, you can move through the list of previously typed expressions ( the result of the corresponding expression for the moment when it run, will become the current row in the window above. You may move through the results of expressions, if you double click on any line in the input window appears appropriate for this outcome expression. The :record command opens the Record Inspector - the dialog box with a list of fields of a current record of a database, determined with an alias <cAlias>. If the alias isn't designated, the current workarea is used. The :inspect command opens the Object Inspector or Array Inspector, depending on the type of a <cVarName> variable, - the dialog box with a list of variables and methods of an object <cVarName>, or, respectively, of the array items. It is possible to input only first letters of a command, even an one letter. So, to view a current record of a current workarea, it's enough to input :r.
Font (set via the menu Options/Font) and the path to the sources can be saved in the configuration file, using the Options/Save settings. This configuration file hwgdebug.xml is in the same directory as the executable hwgdebug.exe. In the same file, you can save a breakpoints (Options/Save breakpoints), so that the next time you debug the program does not install them one by one, but restore all at once (Options/Load breakpoints). Breakpoints for each program being debugged stored separately, you can change them if necessary before starting the debugger, with any plain text editor. In the same directory with the hwgdebug.exe should be yet another xml file - hilight.xml - configuration file for syntax highlighting.